What are Better Breathers Clubs? Living with a chronic lung disease can be easier. 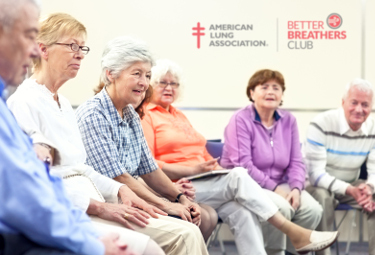 Better Breathers Clubs are welcoming support groups for individuals with chronic lung disease and their caregivers. Learn better ways to with conditions such as COPD, pulmonary fibrosis, and asthma while getting the support of others in similar situations. Led by a trained facilitator, these in-person adult support groups give you the tools you need to live the best quality of life you can. Please use our online form to communicate your interest in joining the Better Breathers Club - Philadelphia, PA. This Better Breathers Club will held on the last Tuesday of the month at the Jane and Leonard Korman Lung Institute in Philadelphia. All Club sessions will run from 12:00 PM to 1:00 PM. Click here for directions to the meeting. April is Sarcoidosis Awareness Month and the American Lung Association and Foundation for Sarcoidosis Research are getting the word out about this rare lung disease. We invite you to attend a Better Breathers Club meeting on Tuesday, April 30th between 12:00 - 1:00 PM to learn about sarcoidosis and engage with others also living with chronic lung disease. Festivities include a guest speaker, networking, refreshments, a raffle and other giveaways. Please wear something PURPLE in solidarity with those living with sarcoidosis.